You have to admire Andrew George. Or at least I do. Commentators are busying themselves accusing the Liberal Democrats of inconstancy or hypocrisy in supporting his Private Members’ Bill to reform the Bedroom Tax. But we should remember that George has ploughed a rather lonely furrow in consistent opposition to the policy from the start, even as the bulk of the Liberal Democrat Parliamentary party repeatedly lined up behind the Tories to support it. And it shouldn’t be forgotten that the George’s Affordable Homes Bill, if it were to be successful, would bring housing benefit policy closer to current Liberal Democrat party policy. In that respect the Liberal Democrats can’t be accused of hypocrisy. The more problematic issue is why the Libdem leadership supported a policy of such obvious boneheadedness in the first place. Nor is it hypocritical to change position on a policy as new evidence comes to light. That is entirely reasonable and sensible. The more problematic issue is that the evidence that is said to have triggered the Liberal Democrat leadership change of position is not, really, very new. It largely confirms what people who understand the housing sector have been saying about the policy’s likely consequences since before the policy was implemented. But there is some very clear hypocrisy and obfuscation in the Liberal Democrat messaging around yesterday’s events. 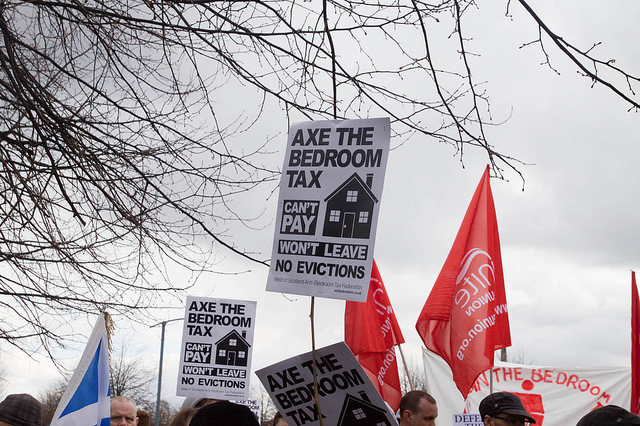 There have been attempts to suggest that somehow the Bedroom Tax was a Tory policy rather than a Coalition policy, which the party is taking a stand against. That is breathtakingly implausible. And there are also justifications being offered for the current policy stance which don’t stand up to a moment’s scrutiny. For example, it is suggested that the party won’t support the reverse of the Bedroom Tax policy entirely because the housing benefit bill has risen dramatically over the last decade and therefore something needs to be done. The bulk of that rise is a result of more claims in the private rented sector. Where the housing benefit bill is increasing in the social rented sector it is rather more likely the product of the Coalition’s affordable rent policy than underoccupation by existing tenants. George’s Bill is only seeking to mitigate some of the worst effects of the policy on the most vulnerable. It is, in practice, a rather modest intervention. While it may be of high political significance – inasmuch as it has seen the Liberal Democrats vote against the Conservatives on such a high profile measure – its impact on policy on the ground is likely to be limited. And there is also a very long way to go before it has any impact at all. Indeed, in many respects it is hard to determine whether it will have much impact at all because some of the key details are being left to secondary legislation. In particular, the Bill ducks the hugely problematic task of defining what constitutes a reasonable offer of alternative accommodation. And, of course, given the approaching election it may be that the Bill never has any real policy impact. 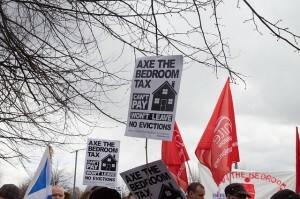 If Labour win then they have made all sorts of public commitments to abolish the Bedroom Tax. It would be a high risk strategy to renege on those commitments. Even though the Bill is relatively modest in its effects in the House yesterday the Tories were forecasting huge financial costs as a consequence and demanding to know what else Labour would cut to compensate. Such arguments should, in my view, be treated with the contempt they deserve. As I’ve blogged before, if the costs of the Bedroom Tax policy are treated holistically then it is very likely that it saves little. Indeed it might well cost money in aggregate. There was a nice case study illustration of the point in a post by Duncan Forbes at 24dash.com yesterday. It doesn’t seem implausible to forecast the demise of the Bedroom Tax in the not too distant future. Then it would join the Poll Tax in the lexicon of past policy blunders. And it will provide policy scholars and other commentators with plenty of material to work with. Indeed, analyses of the trajectory of the policy are beginning to appear or are in development. I gave a paper at an academic conference back in July examining the policy after its first year of implementation. You can read it below, if you’re interested. Image: Helen Beaumont via flickr.com under Creative Commons. One limb of this is no bedroom tax applied if the household has no property to downsize to. Many studies have shown that 6% at most can downsize so this ‘modest’ intervention’ would see 94% taken out of the bedroom tax. The fact the proposals are unworkable is yet another matter, what for example is a suitable or reasonable offer; where on earth is such an offer to come from given there is no such ‘offer’ in existence with CBL but rather a bidding system..and I could go on and non with this woefully drafted proposal. But to call them ‘modest’ is most definitely false. Good point Joe, but it depends on the point at which you judge its modesty or ambition – before or after thinking about the implementation problems. I agree, and I’ve blogged previously, if you fully factor in the absence of alternative properties and every hhld with a disabled member (the second of which the PMB doesn’t do; it also takes no account of the backlogs in assessment for PIP etc when it restricts exemption to recipients, implies that the adaptations have been made for the current tenant, etc) then it potentially exempts the vast majority of those affected. The policy would be as good as dead. But I guess I was getting ahead of myself in thinking what would come out the other end. Which I suspect – if it is anything concrete at all – will be some tightly circumscribed situations in which the hhld will be exempt. Therefore, modest. I could turn out to be wrong in that prediction – an expansive definition of the absence of alternative accommodation may eventually emerge. You make a fair point.